Sat., March 24, 2018, 9:21 p.m.
Four of the five Notre Dame starters reached double-figure scoring in the Irish’s win over Texas A&M. 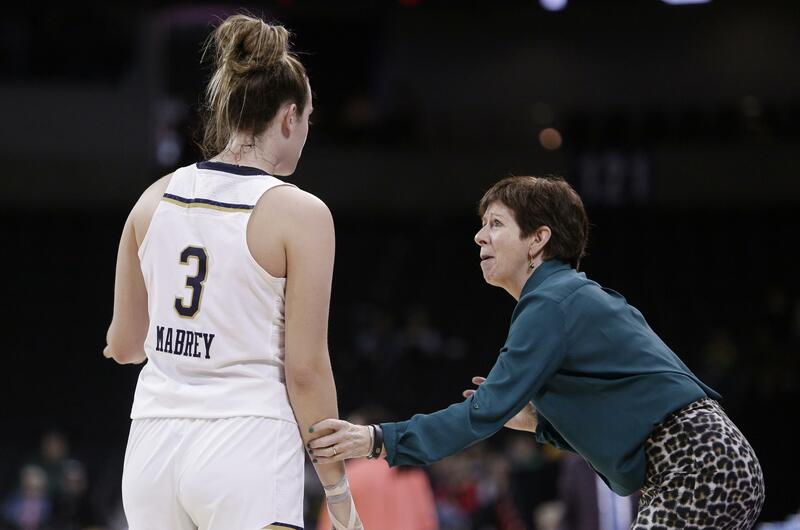 But Irish coach Muffet McGraw called a basket by injured Kathryn Westbeld the most critical of the game. Westbeld suffered an ankle injury in Notre Dame’s tournament-opening win over Cal State Northridge. She sat out the first half against Villanova before playing the second half. She hit a jumper from the free-throw line, giving the Irish an 87-82 lead over A&M with 1:15 remaining. She finished with four points, six rebounds and three assists. “I’m just so proud of this team and what we accomplished, especially Kathryn Westbeld playing basically on one leg,” McGraw said. McGraw thought Westbeld’s presence for 32 minutes was huge. “She made a big impact on the game (and) she hasn’t recovered yet,” McGraw said. “Unfortunately, she wasn’t able to practice this week. She was in a boot. It’s probably not going to get better by Monday’s game. Texas A&M coach Gary Blair had some kind words for tournament officials. Blair took a moment to caution the injury-riddled Irish. Notre Dame advanced to the Elite Eight for a second straight year and its seventh time in the last eight years and ninth overall. … Marina Mabrey hit a career-high seven 3-pointers for the Irish. It’s also the most 3s by a Notre Dame player in 15 years. Her five 3s in the first half are the most since 2015. … Mabrey also had a season-best nine assists. Published: March 24, 2018, 9:21 p.m.